Newborns cannot have submersion baths until their umbilical cord falls off and is healed (and a boy’s circumcision site is healed). During these first couple of weeks if you would like to bathe your child you should sponge bathe them. 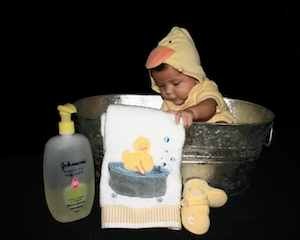 The challenge with sponge bathing is to keep the infant warm and happy. After the umbilical area (belly button) has healed you can give your child a real bath. Unless your baby is a big spitter their is little need to bathe your baby.